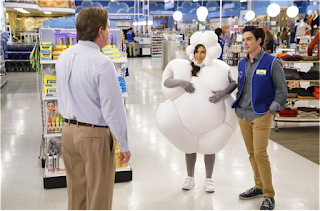 In the latest episode of Superstore, the Cloud 9 employees are reeling after the chain’s official spokesman, “Kyle the Cloud” is arrested for murdering — and eating — 14 people. Jeff, the regional manager, is back to do damage control and to answer any questions about Kyle’s “improprieties.” Per usual, the employee questions are mostly bizarre and unrelated to Kyle. Glenn takes the opportunity to tell them all he’s sure that Kyle is innocent. He met him at a corporate conference last year and Kyle “seemed like a good guy.” Jeff refuses to weigh in on this proclamation. After the meeting, Jonah and Amy are tasked with removing all the Kyle the Cloud advertising in the store. There sure is a lot of it, considering we’ve never caught a glimpse of any of it in previous episodes. There are weekly fliers and huge cardboard cutouts, t able tents and murals. Amy and Jonah proceed to paint over the mural, declaring this the worst day ever. Meanwhile, Cheyenne is in the break room showing Garrett and Sandra dozens of pictures of her new baby. Mateo bursts in, wanting their opinion on whether they think Jeff is into him. He relays that last week Jeff said, “I noticed you.” Mateo has taken this to mean Jeff likes him, but the others are unconvinced and make fun of him for being presumptuous. Determined to prove them all wrong, Mateo sets out to find Jeff and get him to say more nice things. Dina and Glenn are out on the showroom floor watching the televisions in the electronics area. The police have now discovered a secret dungeon where Kyle the Cloud videotaped himself eating and murdering his victims — while in cloud costume, naturally. Glenn is devastated to learn that he was wrong about Kyle. But then the police announce that they also discovered a “coffin full of hair” as well as marijuana at the scene. Glenn is overjoyed at the news that marijuana was discovered. He hugs Dina, exclaiming that if Kyle was high, clearly he wasn’t at fault for his actions — the marijuana made him kill and eat all those people. Amy and Jonah are still busy cleaning and clearing out all the Kyle the Cloud materials. Amy reminisces about how the store used to make them wear the cloud costume to hand out fliers. Jonah dares Amy to put the costume on and walk around the store. Because they have nothing better to do, she does. Jonah also tells her to make eating noises and say she’s hungry, which she also does. They run into Glenn, who tells them it’s okay because Kyle is not a cannibal; he was simply high. Amy and Jonah try to explain that being high on marijuana would not turn someone into a killer. If it did, half the employees would be murderers. Glenn is shocked to learn that so many people do marijuana. After trying to casually sniff a few employees, he confides to Dina that he thinks they might have to start doing mandatory drug tests. Dina is all for it and springs into action. Glenn still has mixed feelings about the drug testing but Dina assures him it’s the right thing to do. While Dina corrals the employees in the break room to collect urine samples, Amy and Jonah’s dares have escalated. Jonah spends some time inside one of the freezers, Amy sings “Charles in Charge” over the loudspeaker, then they attach a kayak to a wheeled cart and ride it down the aisles. Jeff spies them in the kayak and asks what they’re doing. Product testing, they say, and Jeff believes them. Mateo has spent the day trying to get Jeff to say nice things to him in front of Garrett, which hasn’t really been working. At the end of the day, Jeff approaches him alone and finally asks him out. Mateo says yes and declares that he can’t wait to rub it in Garrett’s face, but Jeff says he can’t tell anyone since it’s against corporate policy for someone to date subordinates. While Mateo mulls this over, Glenn goes to Amy for advice. He’s feeling really rattled about being so wrong about Kyle the Cloud. He worries that if he misjudged Kyle, then he must not really know any of the employees. Amy reassures him as Jonah stands at a distance, holding up various objects that Amy must use as analogies for what each employee is like. Cheyenne is like a yoga mat, Jonah is like an alarm clock, and Glenn is the golf club of the group. Glenn really latches onto these totally on-the-fly analogies. They help him realize that he shouldn’t drug test the employees — he should just trust them — and so he runs back to the break room and dumps out all the urine samples, much to Dina’s horror. Jonah has one last dare to perform for Amy before they leave for the day: he comes out wearing only a Cloud 9 smock and nothing else. Unfortunately for him, Amy’s husband has just arrived to pick her up and the dare is ruined. Jonah makes up an excuse for why he’s basically naked and wanders away. Amy’s husband wants to know why he was dressed like that and Amy says he’s just a strange guy. Her husband muses that perhaps they should try setting Jonah up with Amy’s brother. This was another fun, albeit morbid, episode. Between murdering pigeons last week to murdering people this week, Superstore has really been in a gruesome mood. I’m a little afraid to know what they have planned next week, but you know I’ll be tuning in anyway!